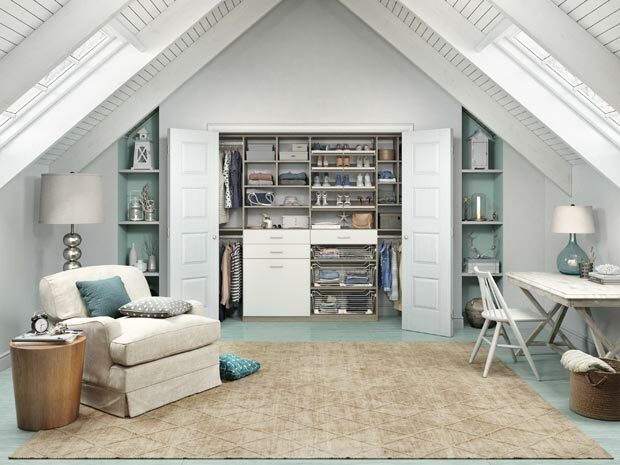 A reach-in closet requires a combination of high function and bedroom design aesthetic. 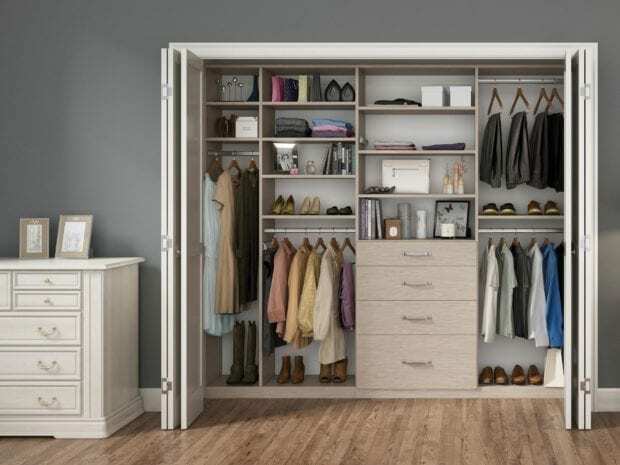 Drawers, shelves, inserts, differing heights of hanging rods, and other options give clothing, shoes, and accessories a home that is organized and easily accessible. A custom-designed closet includes space-saving options, such as multiple hanging areas, adjustable shelving, drawers, baskets, and hampers. Pull-out accessories such as belt, tie, scarf, and valet rods maximize space and organization. 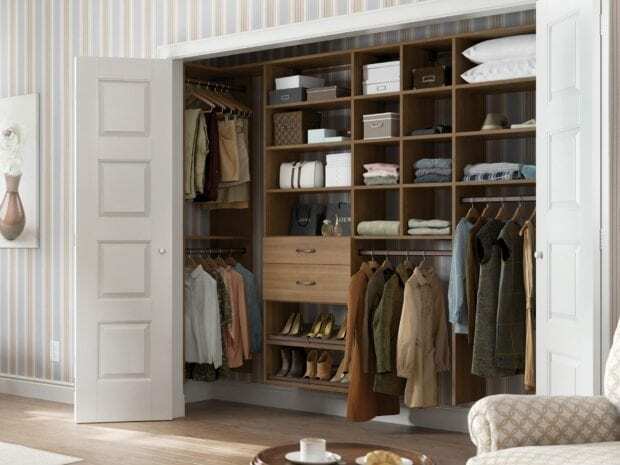 A set of drawers in a reach-in closet adds storage capacity and puts everything within reach. 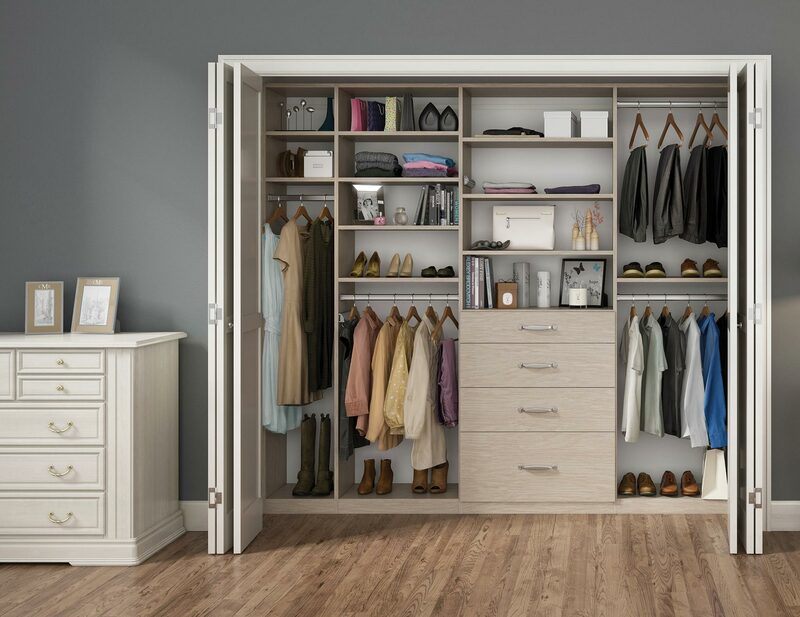 Our drawers feature dovetail construction, undermount slides, and quiet soft-close mechanisms to ensure superior quality and a lifetime of use. 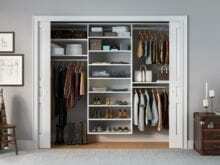 Options for on- or off-the-floor construction are available to fit budget, aesthetic, and storage needs. Take advantage of corners with custom solutions that maximize small spaces. 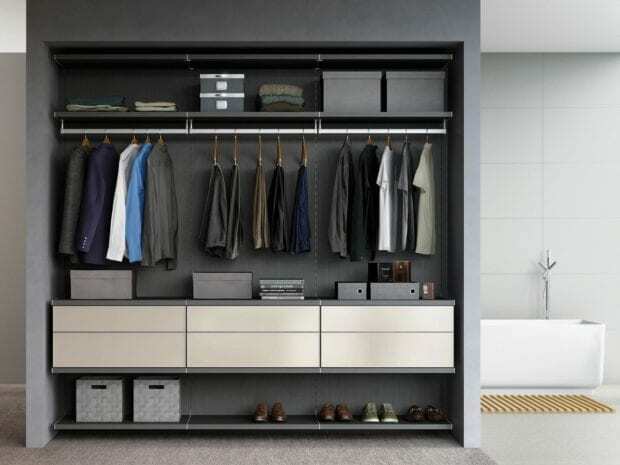 This multi-tiered, reach-in closet system provides clever and stylish design by using dynamic, contrasting finishes. Classic White system creates a modern look. Lago® Siena slab drawer fronts add rich contrast. Matte Aluminum round poles provide hanging space for clothes. 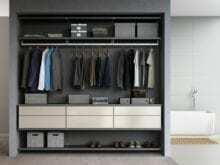 Multiple hanging heights accommodate all types of clothing. Custom-designed to fit a small space, this solution provides ample storage and a built-in, seamless look. Classic White system creates a straightforward and modern look. Slab drawer fronts offer a seamless aesthetic. Matte Aluminum round poles provide hanging space for clothing. 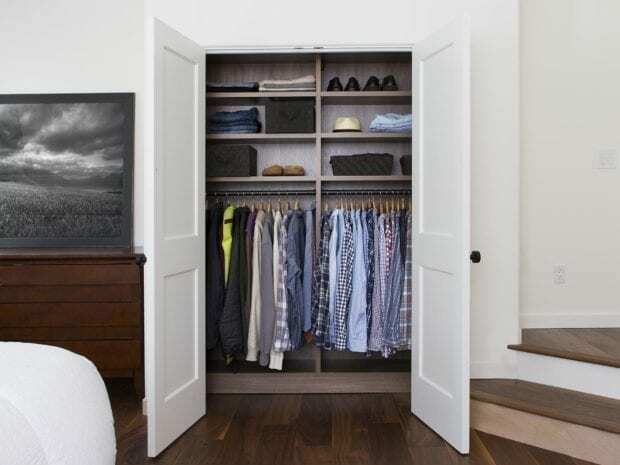 Elegant sliding glass doors give this well-designed storage solution an added hint of chic. European-inspired Virtuoso system creates a modern look. Lago® Milano Grey establishes a simple color palette. High-gloss, solid acrylic Parapan drawer faces in Cappuccino finish add a light touch to the color palette. Matte Aluminum poles provide hanging space for clothing. Push-to-open drawer hardware ensures ease of use. 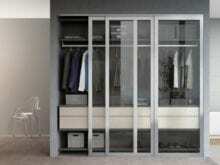 Aluminum sliding doors with clear glass inserts enable easy viewing of clothing and accessories. The chest of drawers built into this well-designed storage solution allows for fewer furniture pieces within the room itself, further maximizing space. Lago® Adriatic Mist finish complements the color palette of the bedroom. Lago® Adriatic Mist slab drawer fronts lend a seamless aesthetic. Matte Aluminum valet rod offers a quick solution for additional hanging needs. 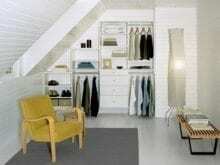 Floor-based system creates a built-in look. Valet rod makes dressing easy. Matte Aluminum decorative hardware adds polish. This straightforward closet provides a solution for every clothing storage need within an understated, streamlined design. Classic White system creates a simple, modern look. 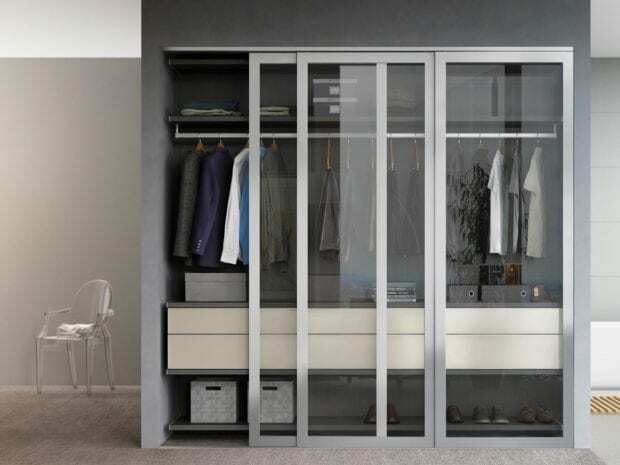 Chrome round poles offer space for hanging clothes. Complete with chic sliding doors, this reach-in closet reveals an elegant storage solution that maximizes space. Lago® Adriatic Mist finish creates a fresh look. 5-piece Modern Miter door fronts with Fossil Leaf Ecoresin inserts add an artistic and natural accent. 5-piece Modern Miter drawer fronts offer a seamless look. Slated Matte Aluminum shoe fences keep footwear in place. Valet rod adds easy accessibility. A decorative top cap detail finishes off the built-in design. 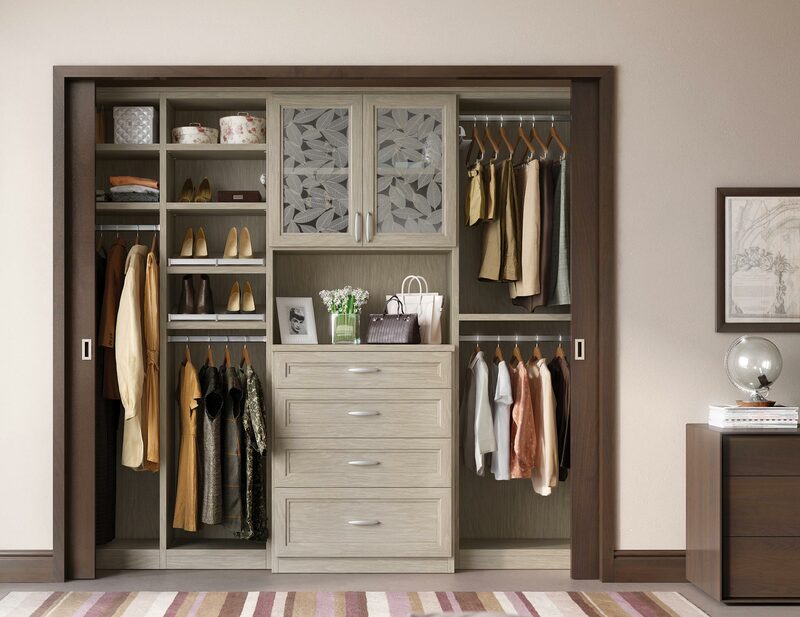 This super-efficient European-style closet mixes warm tones with high-gloss accents for a stunning effect. 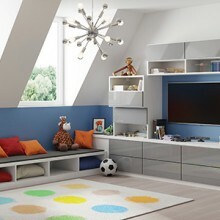 Lago® Milano Grey finish adds to the modern feel. High-gloss, solid acrylic Parapan drawer faces in Cappuccino finish offer a sleek and light touch to the color palette. Matte Aluminum poles add texture and hanging space. 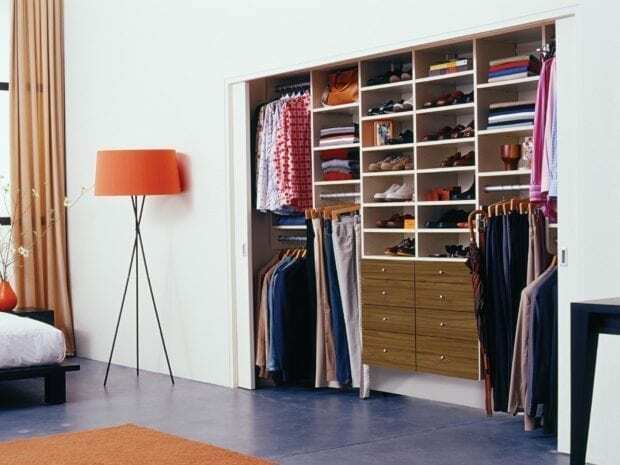 A warm-hued, reach-in storage system complements the colors of the existing room and provides functional organization. Lago® Roman Walnut system complements the color palette of the bedroom. Front-to-back reach-in design creates easy accessibility. Roman Walnut slab drawer fronts lend a seamless aesthetic. Oil-rubbed Bronze shoe fence keeps footwear in place. Oil-rubbed Bronze poles and decorative hardware offer a monochromatic palette. Cubbies offer flexible storage for clothing and accessories. The combination of Dark Wood finish with white allows this closet to seamlessly fit within the existing design of the space. Lago® Roman Walnut finish adds drama and contrast to the white bedroom. Oil-Rubbed Bronze round pole builds a monochrome palette. 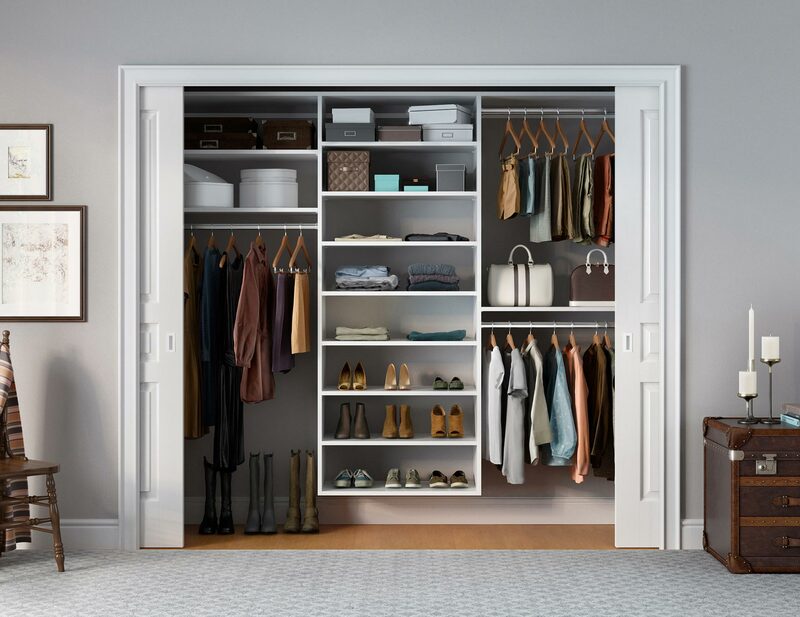 Contemporary reach-in closet achieves a light, seaside aesthetic while ensuring ample storage for clothing, shoes and seasonal items. Tesoro Ash finish with Supermatte slab drawer fronts create the ideal foundation for this chic, yet comfortable, space. Metro Brushed Nickel hardware adds polish. Fold out hampers and baskets provide smart storage while contributing to the airy feel of the space. Shoe fences keep footwear well-organized and easy to access. Matte Aluminum poles with Tesoro Ash edge banding inserts allow for ample hanging storage that blends seamlessly into the overall design.